Ankle injuries are considered one of the most common sports injuries. (1) As a runner, there are many things that can cause your ankle to ache. A friend of mine , for example, was dancing around in the grass and didn't know there was a hole in the ground. That simple step into the hole sprained her ankle and she wasn't able to run for a while. Fortunately, if you feel ankle pain after running, it won’t be too difficult to diagnose the cause of the pain. 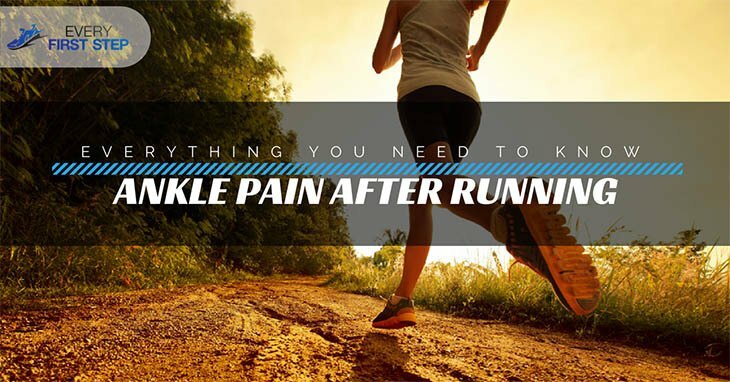 In this article, we’ll talk about five of the most common causes of ankle pain and then we’ll discuss how to heal a sprained ankle fast. Why Do I Feel Ankle Pain After Running? The symptoms of a sprained ankle include the feeling of your ankles popping which may even be accompanied by an audible “pop”. The pain is felt above the ankle bone and usually gets worse the day after. Another symptom is a noticeable lump on the ankle with swelling and bruising in the ankle area which can be very tender to the touch. The severity of an ankle sprain may vary from light to very severe. With a slight ankle sprain, you may even be able to continue your run after the sprain and feel the pain afterward. On the other hand, with severe sprains, even standing may be impossible. Ankle sprains are different from ankle fractures when it comes to the location of the swelling. The Achilles tendon is a large tendon located at the back of the ankle which connects two muscles to the heel. It is the tendon that is responsible for allowing your toes to point to the ground as you run. The condition is not caused by a single injury but is rather a result of repetitive stress on the tendon. For example, a sudden increase in your running intensity can cause the inflammation. The symptoms of Achilles Tendinitis include a dull or sharp pain located at the back of the ankles, limited range of motion when you flex your foot and tight calf muscles. I never knew such a condition existed until my friend sprained her ankle. It turns out she has a history of constantly spraining her ankle with the slightest of twists. Chronic ankle instability may develop following an ankle sprain that has not completely healed or wasn’t rehabilitated enough. After a sprained ankle, you need to do exercises that will help increase your ankle mobility to strengthen the ankle muscles and ligaments. One of the major symptoms of chronic ankle instability is frequently twisting your ankles. This twisting may occur even when you are not doing anything intense such as standing. I actually tried walking around the area where my friend sprained her ankle and there was a very slightly uneven surface. I couldn’t understand how she could suffer such an injury from just that. The answer is her ankles were so weak that the slightly uneven surfaces caused her to twist her ankle. This condition is closely related to having ‘weak’ ankles. Anterior shin splints cause pain in the front outside part of the leg, just below the knee. In short, your chances of experiencing ankle pain increase if you have a shin splint because shin splints can contribute to weak ankles. One of the major triggers of the condition is increasing your running routine too drastically. Also, running on uneven surfaces can put extra pressure on your shin bone. Some risk factors for developing the syndrome include having flat feet, varicose veins, ganglion cyst and swollen tendons. In addition, if you have had a sprained ankle, inflammation in the area surrounding the nerve may trigger the compression. Symptoms include a burning or numbness in the ankle area, sensation that ants are crawling on you and a shooting pain. The symptoms are felt either inside the ankle or on the top of the foot and may be either isolated or extend to the calf and toes. When it comes to Achilles Tendinitis, a few days with proper care may be all that is required. Those who suffer from chronic ankle instability may be facing a lifelong recurring condition. Anterior shin splints may take 3-6 months to heal. (9) The pain caused by tarsal tunnel syndrome can be managed but the condition is often only totally removed after surgery. Depending on the cause of your ankle pain, there are some steps you can follow in order to recover in the shortest possible period of time. Although ankle injuries are one of the most common and often take quite some time to recover from, knowing the cause of your sprain can be a great help. Once you identify which of the five causes is likely applicable to your situation, take the necessary steps to speed up healing. Once you have an ankle injury, you are at higher risk of getting another in the future so it is important that you strengthen your ankles and follow a reasonable degree of intensity. How did you like this information? ​Have you ever suffered an ankle injury? I'd love to hear all your stories in the comments below. Also, remember to share.